Welcome to Feldman Family Law. Conveniently Located in Wellesley Massachusetts. Feldman Family Law was established in 1982 to provide comprehensive representation in the area of divorce and family law throughout Wellesley, Massachusetts. We are dedicated to providing our clients with the highest quality legal representation in cases involving: divorce; mediation; child custody; child support and visitation; parenting plans; alimony and spousal support; complex property settlements; high conflict custody and visitation including international custody cases; paternity; restraining orders, and premarital and prenuptial agreements. With over thirty-two years of experience we provide a friendly environment, compassionate and reliable representation yet aggressive enough to get you the results you need to move on with your life. 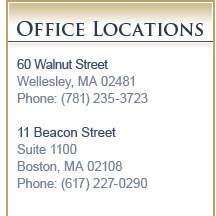 We have offices conveniently located in Wellesley, Massachusetts. Find out how we can help you get through this difficult period in your life. Making the decision to hire a family law attorney or mediator is difficult. Finding the right lawyer or mediator with the experience and compassion to effectively safeguard your current and long-term interests is essential. I opened the Feldman Family Law to provide comprehensive divorce and family law services to professionals throughout the Boston area and eastern Massachusetts. I recognize that divorce touches every aspect of my client's lives. Property division economic security, children's issues, and spousal support are central concerns in any divorce proceeding. I work closely with my clients to develop effective strategies to protect 401Ks and inheritances, and to ensure my clients can maintain their standard of living after a divorce is final. In addition, I have significant experience drafting, defending, and challenging prenuptial agreements. Often the most intractable issues associated with divorce are child custody and child support matters. I work closely with my clients to protect the interest of their children, while assuring, when appropriate, that both parents continue to play a role in their child's life. I also have significant experience dealing with paternity issues and grandparents' rights matters. I also have a great deal of experience in dealing with international custody and divorce cases. for a initial consultation for Divorce. I can be reached by phone at (781) 235-3723, by e-mail.